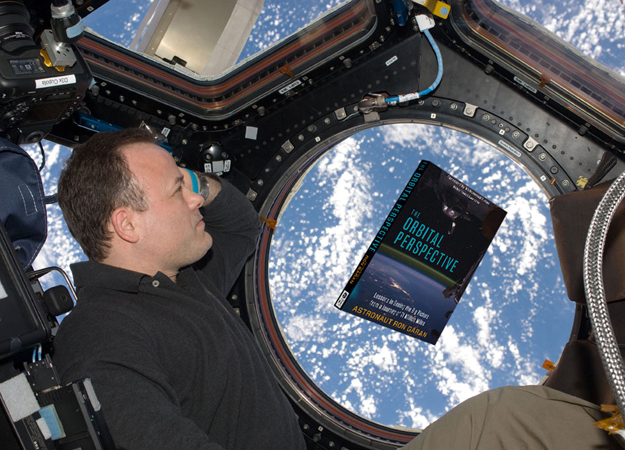 The last time Ron Garan saw the curvature of the Earth and the blackness of space was from his vantage point aboard the International Space Station. The next time he will see this sight will be from inside the capsule of World Views' high altitude balloon at the edge of space. Unlike both of his trips to and from space he will be in command of the capsule which will land under a large, steerable parawing. He'll be doing the steering. And when he does he'll be the first person to ever pilot such a flight. The flight profile is rather straightforward for a high altitude balloon. After liftoff from the Tucson spaceport, the balloon will take an hour or two (depending on conditions and payload) to ascend to its target altitude of 100,000 feet. The balloon will then dwell at that altitude for several hours. Passengers will be able to look out large windows and have a drink. Descent will begin by venting the balloon and releasing helium. 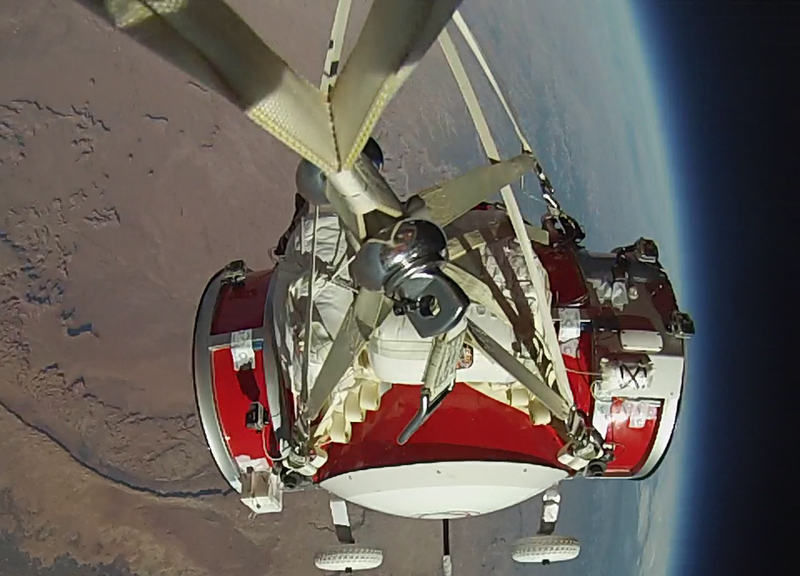 At 50,000 feet the capsule, suspended beneath its parawing will detach from the balloon. The balloon will simultaneously deflate and head for a landing and reuse. Meanwhile the capsule will begin to fly its way down under control of Garan. As it nears its landing site the parawing will flare and allow a gentle landing back on Earth somewhere between 0 and 300 miles from its launch site. On initial flights Garan will be accompanied by a skilled parachutist as copilot. Up to 6 passengers will be aboard. The capsule has a back up parachute and has the ability to be remotely controlled throughout its entire flight profile should that ever become necessary. Testing has already been done on a sub-scale model and is proceeding at a healthy pace. Garan would not provide a specific date for the flight of the first passenger vehicle (which will be remotely controlled) or when the first flights with people aboard will take place except to say that it will be within the next several years. Garan comes to World View with an impressive resume. Before becoming an astronaut he was a decorated Air Force combat and test pilot as well as an instructor. While at NASA he flew one shuttle missions (STS-124) to the International Space Station in 2008 and returned to the ISS in 2001 via Soyuz for a 164 day stay. He's also a social minded entrepreneur who has established several non profits and worked on various global climate change and economic development projects including repeated visits to Rwanda to install clean water systems. During his ISS mission Garan's transformation from run of the mill astronaut to global citizen became obvious. Garan is a proponent of a phenomenon observed by many space travelers: "The Overview Effect" a term first coined by author Frank White. In a nutshell, some people (like Garan) find that their trip into space confronts them with the profound beauty and immensity of Earth, a growing appreciation of how special and yet small and fragile Earth is, and a conclusion that people need to think in a global context so as to protect Earth from forces that might hamper its ability to support human life. Hence there is an effect from having been given such a planetary overview and in some people it can be transformative. Not surprisingly Garan wrote a book in 2015 about his transformation called "The Orbital Perspective" - a title that has overt resonance with Frank Whites "Overview Effect". (see Book Review: The Orbital Perspective ) In preparation for his ISS visit he worked with people outside of NASA to set up the Fragile Oasis website. This website took a fresh approach that is never seen with a website developed internally at NASA. In a review of his book I noted "One time when we were having lunch, Garan told me that he thought that his greatest contribution(s) to society as a person still laid ahead and that his astronaut career, while enjoyable, was just one step in his life. Flying in space was a humbling enabler for Garan. Garan's take on his experience at NASA is refreshing when compared to many other astronauts who see their NASA career as a high point and now only seek to run out the clock at a large aerospace company pulling in the big bucks." So here we find Garan - at a small aerospace startup that seeks to shift a few paradigms. There are a handful of space companies with commercial services that will range from suborbital to orbital spaceflight. Not all of the leading companies have released prices. Virgin Galactic will sell you a short trip into space for $250,000. XCOR will sell you a short flight albeit to a lower altitude for $150,000. At the present time SpaceX and Boeing are only selling orbital seats to NASA, and Blue Origin has not revealed what it is they will be offering. World View offers a longer experience to a lower altitude for $75,000. Although no significant marketing has been done, a number of tickets have already been sold according to Garan. Things cost what they cost and commercial companies need to recoup development and operational costs - and provide an eventual profit to investors. As was the case with domestic air travel, so the story goes, initial flights into space will be expensive but somehow that will lead to more people flying and costs dropping. Given that no one has actually flown a commercial customer into space (if you exclude Soyuz flights) we'll have to see if this conventional wisdom transforms into reality. Given Garan's avowed interest in global issues and expanding access to space I asked him about the whole pricing issue. He was very clear that he and World View intend to pay attention to cultivating a very wide audience. They really want people to experience something transformative. Two of World View's founders, Taber MacCallum and Jayne Poynter, were participants in the Biosphere II project and were involved in the more recent Inspiration Mars project. Given the paradigm shifting nature of these projects and the focus they place on outreach to a wider audience, it is not surprising that they'd be seeking to craft the World View experience to accomplish more than just fly up to 100,000 feet. MacCallum and Poynter, and their other company Paragon Space Development Corporation were recently involved with StratEx (Stratospheric Exploration) which took Google Exec Alan Eustace to the edge of space beneath a high-altitude balloon. In so doing Eustace successfully set a world record skydive from 135,908 feet. World View has since acquired the key technology, personnel, and lessons learned from this project. World View has also completed a successful test of a 1/10th scale model of their World View capsule. Cool stuff, but how is this going to impact those of us who can't afford a ticket? While Garan did not get into specifics I got the impression that World View has given serious internal consideration to creative financing for non traditional passengers for whom the trip could be life- or career-changing. Students, for example. At a price point of $75,000 you're still out of reach of what most people can ever expect to afford. But with some discounting and creative financing you enter into what I call "bake sale" territory i.e. sums of money that could be raised by an average community for projects such as flying the local high school valedictorian or the winner of an essay contest. In my opinion when you crack this barrier and start to fly people who are not personally wealthy you get a chance to shift some real paradigms and expand people's understanding of personally exploring extreme environments. But a balloon ride is not a trip into outer space, so where does it fit in the ecology of various companies that seek to fly up to space? At 100,000 feet you're at the proverbial "edge of space". People argue about what the "edge of space" means or exactly where it is. The usually accepted definition of "space" is the Karman line 62 miles above sea level. Being at 100,000 feet puts you 19 miles above the Earth's surface. So where is the "edge"? How wide is it? Well, you're above 99% of Earth's atmosphere. Going another 40 or so miles will not change the atmosphere very much. Earth's curvature will be quite apparent and the sky will be deep black of space. Outside temperatures will be around -50F. Inside the capsule the only major difference between orbital flight in space and high altitude flight at the edge of space will be the fact that you are not weightless. To be certain, the view will be spectacular for everyone aboard. But there is much more to the potential of the World View balloon than just flying human passengers to look out the window. While the specifics are still being worked out, a range of payload opportunities are under consideration. Given that conditions outside of the capsule will be close to those experience in orbit (with the exception of microgravity) World View is looking at offering a way to test fly payloads including Cubesats before placing them in orbit. This way if things do not work out you get the payload back such that you can resolve the problem. If it does work, well, you still get it back. Then there's aeronomy payloads specifically designed to explore this region of Earth's atmosphere. In addition to payloads attached to the capsule thought is also being given to things such as carrying rockets to altitude and then launching small payloads into orbit. Gliders could also be dropped. Given that conditions at 100,000 feet closely resemble those on Mars, a number of advanced exploration concepts could be tested. If crew safety is an issue, this balloon system will be capable of full automated/remote controlled missions. If things go according to plan World View seeks to transition from using Helium to Hydrogen. Not only does this shift away from a non-renewable resource it also provides additional performance. While the basic package for passengers is to spend several hours aloft and then land close to the launch site, this balloon system is capable of staying aloft much, much longer and covering much greater distances. As such it is possible that the balloon could carry passengers across continents or oceans. It is also possible that it could be outfitted in a similar fashion to the long duration balloons NASA flies with astronomy and atmospheric payloads on board. In addition, these balloons could be flown over a specific location for long periods of time to make observations or to act as communication relays - with obvious uses during natural disasters. None of these ideas are exactly new. But when you begin to combine them within the product portfolio of a large-scale, commercial, scalable, frequent flying high altitude balloon service, you are certain to see an expanding market, lower costs, and inevitable synergistic and emergent possibilities that no one has really thought about yet. If World View does manage to make a successful run at being a commercial venture I think it has a chance to offer many more people with an experience that emulates a real trip into outer space than the more expensive ventures planned by other companies. I also think that World View has a chance to inspire people to want to fly again - higher and further - perhaps into space on other companies' vehicles. And, as I noted earlier, when the prices start to dip such that it truly becomes possible for anyone to experience space, well, that is when the magic starts to happen.